The beach was the most popular vacation home location. More Americans may be looking to get away as vacation home sales jumped last year. Vacation home purchases made up 21% of all home sales last year at an estimated 1.13 million, the highest level since 2003 and a 57% increase from 2013, according to a report from the National Association of Realtors. The stock market's strong performance and gains in the labor market are creating more confidence among buyers, according to Lawrence Yun, NAR's chief economist. "The top 10% of families are feeling much more financially confident." The typical second-home buyer had a median household income of $94,380, 58% had two income earners and 48% financed less than 70% of the purchase price, according to NAR. A beach location was the most popular among vacation buyers, and 54% of properties were single-family homes. The survey included close to 2,000 adults who made a residential purchase last year, not including institutional investment sales. Tight inventory levels continue to plague many housing markets and push prices of primary residences up. However, the median price for vacation home buyers came in at $150,000 last year, an 11% decrease from 2013. 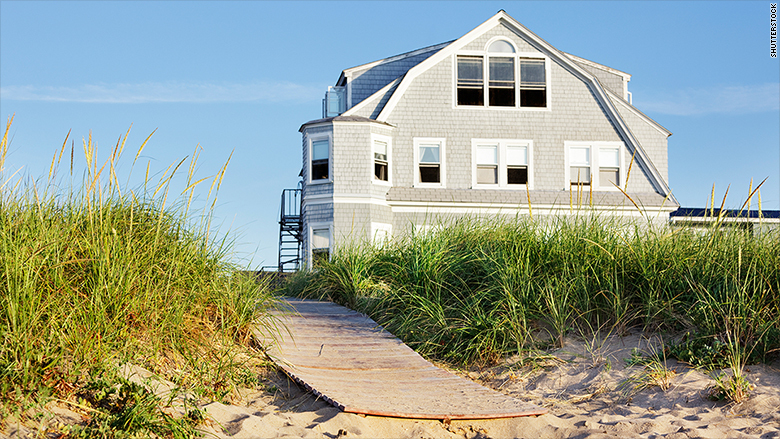 Distressed properties made up 45% of vacation home sales last year, the NAR reported. "People looked at long-term opportunities and grabbed low bargain prices," Yun said. He added that popular vacation home areas, like the beach and mountains, tend to have a slower economic recovery pace. As more buyers scooped up vacation homes, the share of first-time and investment buyers declined in 2014. Investment home sales dropped 7.4% last year. Generally, investment and vacation purchases tend to move in the same direction, Yun explained, but the recent rebound in home appreciation has priced out many investment buyers, particularly institutional ones as their main goal tends to be rental income. A third of second-home buyers plan to use their purchase for vacation, and 46% of the homes were located in the South. Baby boomers on the cusp of retirement are also playing a role in the sales surge, according to Yun, with 19% of all vacation home buyers planning to eventually make their second home their primary residence. "If they have the financial capacity to buy a vacation house today, once they officially retire in three to five years, they will turn that home into their primary residence."